AmeriCorps member, Jay Culkin, reflects on the corps member experience during City Year's MLK Day of Service in Astoria, Queens. Check out more photos from the event here. In temperatures below freezing, all of City Year New York’s AmeriCorps Members poured into I.S. 126Q from trains, buses, and even by foot on Monday, January 18th. The tips of their ears were numb and red like their bomber jackets and breath came from everybody’s mouths. They were all there for Dr. Martin Luther King Jr. Day. The Friday before the big day, a huge chunk of the corps showed up to prep the school building for a day that is close to our hearts for who and what the day honors. They set up paint stations, transported wood, created photo booths for volunteers, and performed so many other tasks that physical service at City Year usually requires. AmeriCorps Members started their day on MLK Day by putting the finishing touches on our service project, power greeting approximately 700 outside volunteers, and making sure that our opening ceremony ran smoothly. 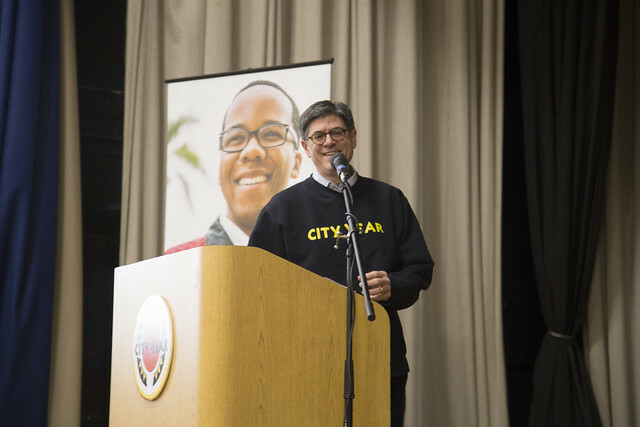 This year, volunteers from places like Skadden, T-Mobile, Enterprise and many others joined City Year! City Year alumnae even showed up to help out a few blocks down at the Boys & Girls Club of Astoria, Queens. After an opening ceremony, where City Year New York’s Vice President and Executive Director, Erica Hamilton was accompanied by Jeremy Kroll, CEO and co-Founder of K2 Intelligence and U.S. Treasury Secretary Jack Lew, volunteers went to work making IS 126 a more engaging place to learn. Together, City Year and the volunteers completed projects on five floors of I.S. 126Q. Storage closets that were cluttered by materials that were decades old were cleared out to make room for new and improved material. Murals were painted along the hallways were students walk to and from classes every day. Book shelves were built and painted. Inspiring words were painted across a bunch of canvases and canvas banners. After a tiring three plus hours of continuous hard work, volunteers enjoyed what was left of the treats Starbucks provided for us and left with a warm thank you and candy bag from City Year New York. As I left the school on MLK Day, one thing was certain, students will hardly recognize that school they left the Friday before. In only a few short hours a community of volunteers came together and changed this school for the better. There is hope that this event with continue to grow each year so we can expand the impact that we wish to make in the name of Dr. King.